The Set up for the Edmonton and District Quilt Show is later today More Information on the poster. It is all day Saturday and Sunday this weekend. 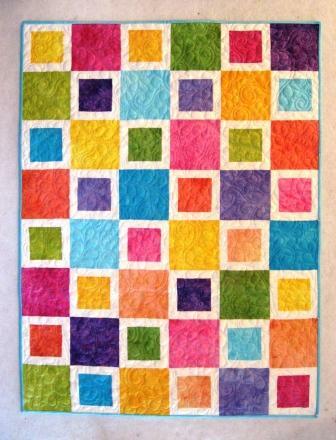 I have dyed cloth and made this baby quilt into kits to sell. Every thing you need is in the kit but backing and batting and thread. 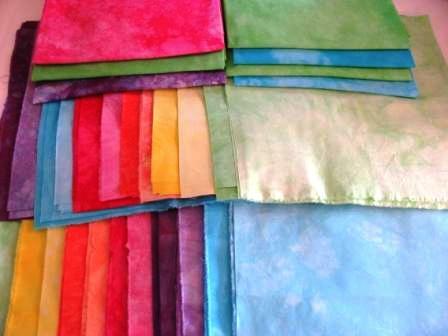 I have the 12 colours of dyed cloth and a large piece for binding and then the White and the pattern to follow. It is all Kona Cotton used in the kits. My friends in my bee group loved the idea and encourager me to do the kit. My Mom has been a great help. She ironed all the fabric and helped edit my pattern. A close up view of the quilting I did on my sample. Below is the stacks of cloth cut and read to go into the kits. Now to just get them all priced and folded in the bags. Hope to see you all at the quilt show (at least you local ladies). I will get some photos at the quilt show to you all next week. 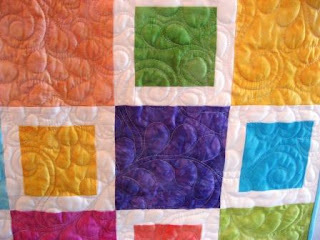 Quilt Show - Great !